We’ve all been there. You’ve finally decided on an outfit, but have a hunch that the look just isn’t complete. There’s still that one thing missing. Bangles are the perfect solution for those days. Whether you go for a style in a bold color or a slightly more understated design, you can’t go wrong. Read on for tips on how to make bangles work for you day or night regardless of your taste. Stack away. Love a good arm party? Let bangles join in on the fun. Layer a bangle with a few bracelet designs you already own in a variety of sizes and textures. The more, the better should be your motto for a fashion-forward look. Don’t be afraid to experiment. 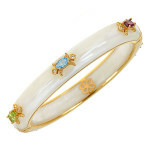 If you’ve always been afraid of color, choosing a bangle in a bright hue is an easy way to face your fear. Colors like blue and orange are perfect for spring and add just the right amount of pop to any outfit. Make it the statement piece. It’s never a good idea to wear too many statement pieces all at once. Let your bangle be the star of the show and hold back on any in-your-face earrings, necklaces or rings. 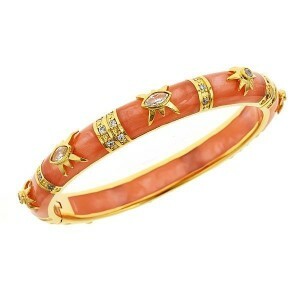 Don’t detract from your bangle’s beauty by having too many other focal points all in one look. Bangles are a great way to breathe new life into your spring wardrobe. Give this trend a try. What are you waiting for?